Looking for a savory snack that you can give your kids after school? 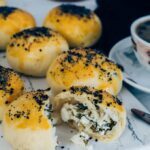 Try this cotton soft homemade Turkish pogaca recipe! Stuff these with cheese, olives or potatoes. All family members will be hooked with the smell when these are in oven. 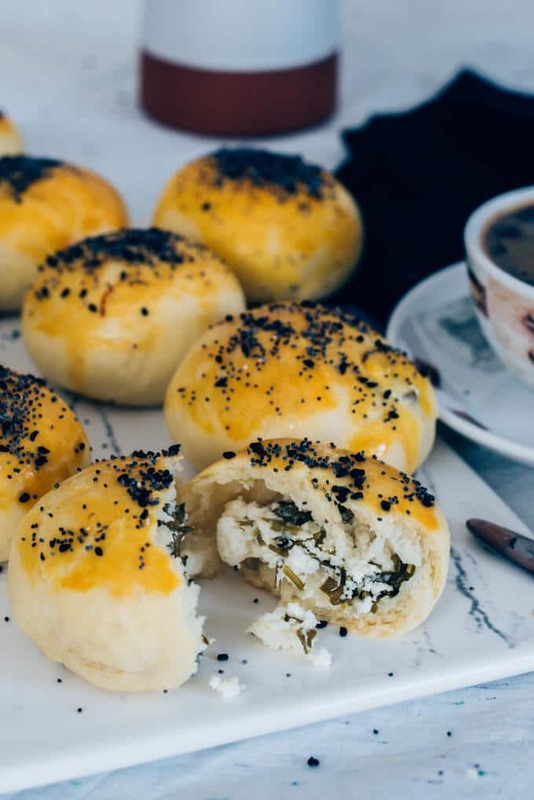 Pogaca is a traditional savory pastry in Turkey just like simit (aka Turkish bagel). You can find pogaca with different fillings such as feta, kasar cheese, potatoes or olives. It is even possible to find it with no filling. Every home cook has their own style of pogaca recipe. They might be big or small in size in pastry shops, but I prefer making them small as they look cuter this way. All pastry shops or bakeries here have these as their main products. People stop by these shops on the way to their work early in the morning because pogaca and simit are the best breakfast when you are in a hurry. Students can find these even at school canteens, so if they can’t have breakfast at home, they have simit or pogaca with a cup of tea as a quick breakfast right before the class. 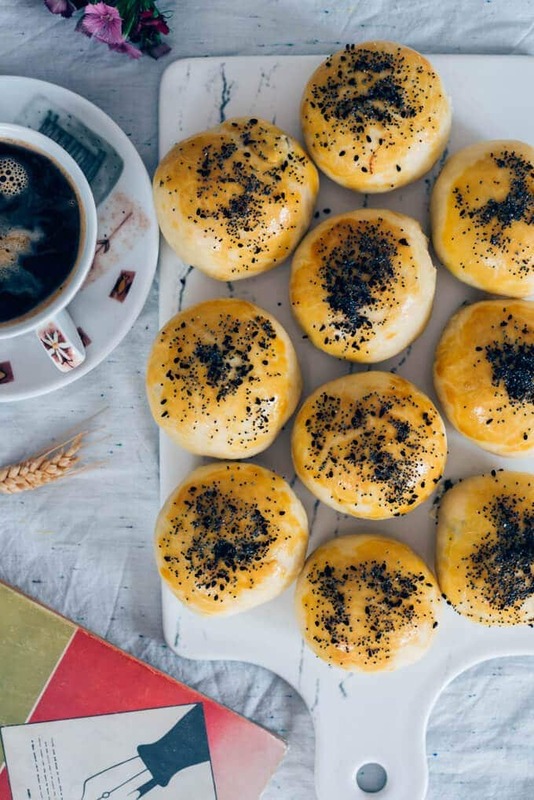 I was surprised by these mini buns when I first tried this pogaca recipe. These are so fluffy and tempting that you can even get up in the middle of the night to have one. It is so easy to make pogaca and doesn’t require advanced-level baking skills. You can make bakery style pogaca at home following this recipe. The very first thing to know when making these super soft buns is that everything should be at room temperature. If the ingredients are cold, your buns won’t get as soft as desired. Also, we need two ingredients so that the buns can keep soft for up to a week: Yeast and mineral water. These two really help the fluffiness. On the other hand, don’t worry if you can’t find mineral water. Use plain yogurt instead. It will help as well. If you are in a hurry though and can’t wait for the dough to rise, go check out our No-Yeast Quick Dinner Rolls recipe. They are soft too but not for up to a week. Finally, you don’t need a machine for this pogaca recipe. You can make it using your hands. It requires just a little bit kneading until the dough holds together. These pogacas are soft for a week, so I generally make these on Sunday as a preparation for weekdays. They make a perfect on the go breakfast. A cup of coffee or tea always goes very well with these. Mix sugar and yeast with milk. Combine all the dough ingredients including this milk mixture and mix them well. You can add a little extra flour or mineral water if either of them is not enough. You should have a pliable and non-sticky dough. Cover it with a moist cloth and let it rest for 45 min. Meanwhile you can prepare the filling. Chop parsley and combine it with cheese of your choice. Take a small piece from the dough and flatten it with your hands. You can do this on the counter. Put a teaspoon of cheese mixture on it and close it up folding the edges upwards like a bundle. Do the same for the rest of the dough. Place a parchment paper in a baking tray and place the pogacas on it. The folded side of pogacas should be at the bottom so that they keep their shape when baking. Beat one egg yolk well and coat all the top of the pogacas with it using a brush. 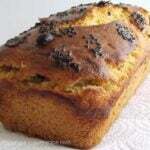 Sprinkle poppy seeds, sesame seeds or nigella seeds on each pogaca. Bake them about 30 minutes or until they get golden. They smell so tempting when they are still warm that I can’t wait until they are cool and always throw a few of them into my mouth. Oh my! That softness! eat the egg yolk well and coat all the pogacas with it using a brush. And sprinkle poppy seeds on each pogaca. Bake them about 30 minutes until they get golden. These ingredients make about 40 pogacas as I make them so small that you can eat them in just two bites. You can make them bigger if you like or you can use the half of these ingredients if you want fewer. This post was originally published in 2010 and has been updated with additional information. Thank you so much for this recipe I just made them and they are so sublime! Hi Hajera! I’m so glad you loved it. I have tried lots of pogaca recipes but this is the best. So soft and tasty. Now my go to pogaca recipe. Thank you! Glad to hear that you loved it Hannah! Zerrin, thank you so much for sharing your recipes! I just made a test batch of your brilliantly simple but very successful pogaça (plural?) — can’t believe how beautiful and tasty they are! My place smells of freshly baked bread and toasted sesame seeds: delish!! I’ll be frank: I was a bit skeptical because your pogaça recipe is so much simpler than the others … but I doubt those other recipes, with so many more steps and ingredients, could be an iota better than your ‘fluffy’ pogaça! & Greetings from Silicon Valley, California. Loved reading your recipe. I am going to try it today as my 8 year old British son loves pogaca and we are unable to buy them in the uk. Can you tell me please, in the UK we have two kinds of flour. We have different types of flour. We have plain flour with no raising agent, we also have self raising flour used for cakes with raising agent in it. Lastly we have strong flour for bread making. Can you advise which flour to use please? Hi Clare! I’m sorry for replying late. I was busy with my 3-year-old son. Well, I have never used the flours in UK myself, so I don’t want to mislead you. I use plain flour for everything here in Turkey. It is not a self rising flour. So probably plain flour in the UK is the same. I’d recommend you to use it. Hope you have a good result. Cheers from Turkey! Really its very yummy &easy to bake.thanks. Oh! Its so yammi soft and so easy to bake.cheese and parsley filling is good but I prefer to fill onion &potato with spice.thanks.